We’re excited to share this article appearing in June’s issue of Celebrate Arkansas featuring Craig and his talent as a photographer. View the digital edition here. The majestic landscape at Yosemite National Park first inspired Craig Underwood to try his hand at nature photography. In the summer of 1995, Craig and his wife Laura traveled through this magnificent park on a vacation. Seeing the beautiful nature photos of Ansel Adams prior to taking the trip, Craig was motivated to bring his camera along and take some landscape pictures. But it didn’t turn out as you might think. He openly admits, “I foolishly thought I would take some spectacular Yosemite landscape photos of my own”. Since this was back in the days of film cameras, he didn’t see his results until the film was developed two weeks after the trip. He became disheartened when he saw his results. He describes these photos as a “dismal failure”. After this experience, Craig used the Pentax K1000 (given to him by his father, Bill, many years before) primarily for taking photos of family and friends. A Fayetteville native, graduate from Baylor University, and the Gemological Institute of America (GIA),Craig has spent the last 28 years as the President of Underwood’s Fine Jewelry. His passion, artistic talents, and creativity have helped create beautiful,nationally recognized,award-winning jewelry designs and more recently, award-winning photography. Although Craig’s first passion is jewelry, he has always had an interest in photography. Craig enjoyed photographing his three boys growing up, but once the youngest entered his teenage years, it was no longer cool for dad to take family photographs. With his favorite subjects no longer willing to pose for him, Craig decided to try his hand again at nature photography. This time around, he pledged to first educate himself on proper techniques. In the spring of 2012, he took a photography workshop from native Arkansas photographer, Tim Ernst. “He is my mentor when it comes to photography,” Craig said. “His weekend workshop was an eye opening experience for me and lit the passion I now have for nature photography.”After this workshop, Craig began taking his photography more seriously. Craig continued “If someone has an interest in nature photography, the single best piece of advice I can give is to take one of Tim’s workshops”. Last summer Craig entered his first photography competition, the “Ozark Photographic Challenge”. Photographers from the states of Arkansas, Oklahoma, Kansas and Missouri participated. The contest featured 10 categories but allowed photographers to only enter in a maximum of three categories,one photograph for each category. Craig submitted photographs for three categories and placed first in two of the three. Craig was the only photographer to win multiple first place awards. A few months after entering in his first competition, Craig entered asecond photo contest. In the 13th annual Photographic Society of Northwest Arkansas Fall Fair Print competition many photographers entered their beautiful works. Craig’s work won first place among all of the entries. Craig’s skill with photographic composition most certainly has its influences from his jewelry design talents.To be able to photograph nature, a specific skill set is used to find the perfect shot. Lighting, symmetry, color and balance are all important factors. Many of these same elements are used in jewelry design. He looks for precious gemstones that explode with life, color and brilliance. Then he will visualize how the gem could be used in a design. Finding that great nature shot is like finding that perfect gemstone for an original design. To be able to do both, an understanding of natural beauty is taken to the next level. Nature photography allows for an artist like Craig to show viewers how he sees the world. When dealing with photography, lighting is one of the most important aspects. Lighting can completely change the feeling of a photograph. “He can see and feel great light – that is one key to being able to capture it in the first place – most people don’t get it, but Craig does,” Ernst says. “It takes a great deal of work and commitment to find and capture great light, and very few photographers will work hard enough to be successful at that – Craig has what it takes, and he is willing to put in the hours”. Color is also a factor which can make a good image into a great image, but it can also ruin that same image. The interaction of color with light can change the photograph,allowing viewers to see an image as if they were there. Craig began to develop his art skills early, during junior high and high school. He performed odd jobs in the family business, such as engraving and some bench jeweler work. This introduced him to the basics of design concepts. When Craig was in high school, he designed some jewelry for pure enjoyment, such as a small eagle head, a cross, and sculptural designs. During his time in California at GIA, Craig took classes on counter sketching and design. These classes laid the foundation for working with designs for different types of jewelry. The skills he learned at GIA were further developed while working for a jeweler in Baton Rouge, Louisiana. 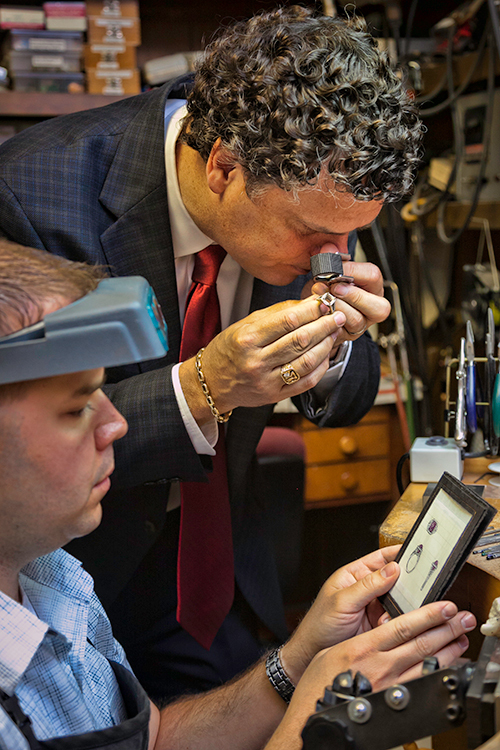 When he moved back to Fayetteville to work in the family business, he worked even more with jewelry design. He has a passion for creating original designs, using the loose gemstones bought directly from cutters around the world. Craig’s designs, built by the Underwood design team, have won national awards. They have also been worn on Hollywood’s red carpet events, such as at the Oscars and the Emmy awards. Two of Craig’s designs have won CASE Awards. Presented by the industry’s largest organization, Jewelers of America, the designs are awarded for Creativity, Artistry, Style and Excellence. With an eye for design, and a mind active with creative ideas, Craig Underwood continues to create beautiful art. His photography uses the raw materials of the natural world, combined with technical skills, to create beauty to hang on a wall. His jewelry designs use raw materials from nature, combined with extensive knowledge and skills, to create stunning, unique pieces, worn and enjoyed every day.